This is a Christmas classic! In this story, a little boy rides a train, the Polar Express, to the North pole where he meets Santa and discovers his belief in Santa Claus. (I'm sure most of you have read this one!) Oh, and if you click on the book above, it will take you to the Amazon site where there is a special on the 25th Anniversary Hardcover book. You get a book, an audio CD, an ornament, and letter from the author for $9.99. I love a great deal! Thanks to my favorite couponing blogger for this one! Logan (2009) our first Polar Express party! We generally make a train out of laundry baskets or chairs and sip "hot" cocoa while listening to this story. This year we decided to invite some special friends to join us in our first polar express playdate. I found a train playdate at Mommy and Me book club so I borrowed some of her ideas for the Polar Express playdate. We even had our first snow of the season the morning of the playdate. It was enough to dust the trees, rooftops, and grass but not stick to the road-- making it look festive but not dangerous to drive-- my favorite kind of snow! We started our playdate with some free play. Of course we had to play with trains! I made a train track from our front door to our backdoor upstairs. (It's times like these that I am thankful for unfinished home that has wood floors that can handle masking tape for decoration). Then we made a train out chairs and gave the boys hot cocoa to drink. They wore their pjs! I gave them jingle bell necklaces (the first gift of Christmas) and we sang Jingle Bells. Then we made an egg carton polar express train. We started with 6 egg carton dividers per boy. We painted our egg dividers. On first egg carton, we added a smokestack and smoke cotton balls. While those dried we went to the basement and just enjoyed free play again while the moms talked-- and the other moms helped me solve nap time dilemas. Life is good when it is shared with a friend! Reading Confetti and Ready. Set.Read! are hosting the 12 Days of Christmas. We are sharing 12 Christmas books and crafts/activities. Here are the ones we have shared so far. Strawberry Cheesecake Santa Hats and Are you Grumpy Santa? Advent Angel Snack and Who is Coming to Our House? 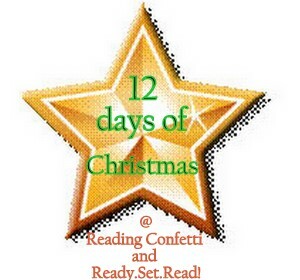 You can also find all of our books and crafts on my 12 Days of Christmas Pinterest Board. Sounds like you had so much fun! I just love that book too! My son makes laundry basket trains ALL the time. He uses laundry (dirty or clean) as his "coal." He'd love that masking tape track! Needless to say,my boys love the Polar Express. Thanks for linking up and sharing your experience with the book. This looks like so much fun. I love the laundry basket train! Thanks for linking up to TCB!